Think you know your company? Think again. We’ve been reading some great stuff at Pravda Media Group that you might enjoy as well. So, pour yourself a cup of coffee, sit down, and get your read on — you’ll feel more productive than if you’re just trawling Facebook. This is a fantastic post by Mike Troiano about branding, and why startups should invest more time and clarify the emotional value of their brand. New York Times offers a fascinating look at the changes in economics and manufacturing which have caused America to lose almost all its manufacturing labor and have severely damaged America’s middle class. With the SOPA fiasco, Y Combinator’s Paul Graham wrote an interesting piece Just kill Hollywood. The point of his post is that it’s not piracy that will kill the movie business, instead it’s different forms of entertainment that will emerge in the upcoming years and gobble up the old paradigm. Lacy claims that in order to actually “kill” or compete with Hollywood, start-ups need to learn their game and let go of the mindset that eyeballs equal quality. Erica Ogg wrote a post about Apple’s new foray into education with textbooks. (rightfully!) claims that these new textbooks are not books at all, but are instead interactive learning experiences: You have text, of course, but you can drag in image galleries, embed videos, 3D models, presentations and slideshows. You can touch and swipe and watch instead of just reading and taking notes. In a time and age where I can chose whether to listen to a brand or to read my friend’s status update – how can a brand get my attention? Isn’t the big idea dead already? Mark Earls believes that big ideas are dead, over used, and that we should focus on small tests and campaigns. However I am talking about differnt kind of big ideas. I am not talking about a short lived one time gig. I am talking about deeply rooted concept at the heart of the brand, that affects its dealing wiht customers, the product they build, and the way they treat their customers. Big ideas are concepts that beyond a product or one’s daily life, that are more important than price or features. Big ideas are ones who change the way we look at life and society. Big ideas are ones that are powerful enough to make the man on the street listen to your message. A big idea is that one story that brings value to people – not only consumers. 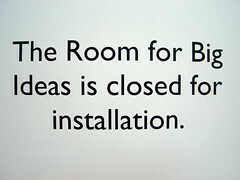 In some cases brands are not openly stating their big idea. In some cases they don’t even realize their big idea until the community, their users, tell them it exists. Let’s take Twitter for example. Twitter’s big idea is communication without boundaries. This idea fueled the Iranian uprise, which in turn personified this idea. As stated before, it was a false hope in my opinion. Still it was amazing to see the energy that this idea brought to the community. Canon and HDSLR are another example. Canon released their 5D Mark II DSLR camera with the ability to shoot HD videos. This quickly materialized to another big idea – everybody can be a filmaker – now in an affordable way. What isn’t a big idea? Well, the product itself. Features, without a wider context, are merely technical parameters. They don’t improve ones life. Price is not a big idea – again, unless it is in a wider context, such as in the case of HDSLR cameras. Also, Fun is not a big idea. Fresh is not a big idea. these are just awesome keywords for a brief. “Like” competitions are definitely not a big idea. Hiring “buzzers” is many things, big idea is not one of them. Modern western society is in a unique situation. World War II ended with the good guys wining. Communism lost the battle. Most of the western world is democratic, and relatively liberal from an economic point of view. Governments are losing their position as setters of big ideas. Yes, Obama most used word was change. But at the end of the day, nations are creating less and less big ideas that affect lives. But people are still looking for bigger than life concepts and experiences. They want to feel that they are a part of something, something bigger than day to day life. They want to be excited! Someone will fill the void. Brands and companies are the best candidates for that. They have the incentive and money to do it. So what’s your big idea?